In our earlier posts we had studied about the vast usage of social media in Asian countries, Asia pacific users’ dominance on global social media and about the China’s own social networking world. In this edition, we are briefing the social media past three years varying status of different web sites, globally. A report from “VINCO” has revealed that social media websites have stronger their grip over the world in quite less time. Social Media status has changed in past three years. In June 2009, 17 different social media websites were ruling over the internet which gradually went down after that. However, such decrement in social media did not affect the constant improvisation in number of users. And Facebook has maintained significant dominance on global platform since June 2009. With 200 million new users out of 100 countries from 127 countries analyzed, Facebook has secured the 1st place since June 2009. QQ was the largest social network in China and worldwide in June 2009 with more than 300 million users. Orkut was the leading social media in India and Brazil. Hi5 was popular among the non-english dominated countries like Peru, Colombia, Ecuador, Portugal, Mongolia and Romania. The Social Media equation changed by the end of 2009; In December, Facebook added 150 million new users to begin a new era for it. However, the social giant was unable to conquered the world’s largest country Russia, in 2009 as russians preferred “Odnoklassniki” and “V Kontakte” till the end of year 2009. This was the time when other social networks like Twitter and LinedIn to up their ante who were dominating among different set of users in various countries. Facebook became world’s largest social networking site with more than 500 million users in 111 countries out of 131 analyzed countries. Whereas, one of the most used social networking site Orkut was sharply loosing its popularity in India. By the end of December 2010 LinkedIn, Twitter and Baidu emerged as other three most popular web sites after Facebook at global platform. Twitter and MySpace were competing neck-to-neck in many countries like Australia, Canada, Germany and Italy. Though, LinkedIn was slow but constantly spreading its arms in countries like Australia, Canada and UK. By the end of June 2011 Zuckerberg- CEO Facebook- joined the élite list of youngest Billionaires making Facebook as most accessed social network of all time. Twitter was fighting for second place with MySpace in the countries France, Germany and United States. Facebook had created an all time record of million users and in kept up its leadership place in 127 countries out of 136 countries analyzed. Europe had become as the largest continental for Facebook with 223 million users, North America has 219 million, Asia 202 million users. Orkut lost almost all of its popularity in India and Brazil to Facebook. India was the second place in producing most number of Facebook active users and Brazil in the third place, while US was in the top place. Interestingly, MySpace was dumped by most of the social users and finally it was transformed into Social Music site – a last effort of survival. In the current scenario, it clearly showcases that Facebook is taken the supreme position as the most favorite Social Networking site among all the countries. Facebook crossed 900 million users and became the most valuable online social property of all time. Europe was the biggest territory for Facebook with 232 million users followed by North America with 222 million users and Asia at third position with 219 million users. 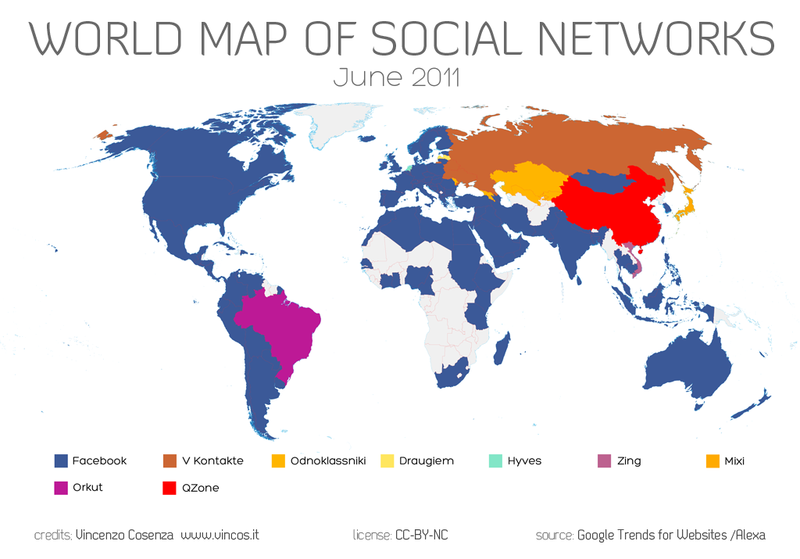 However, Chinese social networking site “Qzone” is at the top position in China with 560 million active users. Followed by “Tenent weibo” with 337 million and “Sina weibo” with 337 million active users, chinese social media industry is updating million posts per day without being influenced by Facebook. Twitter has gained popularity in Japan with more than 30 million active users and Japanese language is the second most used language over Twitter. South Korea’s CY World (social networking site) and Zing in Vietnam are also popular with 25 million users and 7 million users respectively. Going through the above social media facts & figures, it depicts that Facebook will keep up its dominance in the coming years. Whereas other social media networks will be in a neck-to-neck competition for achieving the top place. Though, there are few countries where local social networks still hold majority of users, the growth of Facebook and in countries which are going through tech revolution – like Brazil and Indonesia – is really appreciable. The overall cumulative social network growth has been outstanding till now and Facebook is still the growth from front. Asia, being the largest contributor for social media, is undoubtedly have got major role to play in future too as it holds the biggest room for growth due to single digit population penetration.